Puss in Boots. A fantasy tale of a cat that speaks and shows his master the way to riches. He also helps his master marry a Princess. Ha! Oh yes, he does. The Dame has three sons who all go off to make their fortune. Two of them do reasonably well but the third makes real progress as he has the advantage of being the owner of a magic cat. There is a rather “interesting” fairy, a nasty villain and a female Ogre. Puss defeats the evil with the help of the fairy’s magic. 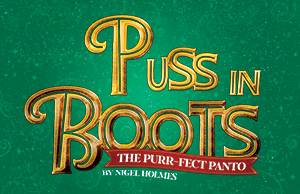 The comedy duo run a shoe shop where Puss gets his boots, and naturally there is a Royal family to impress and a Princess to marry.